Case and Tekna daggers. 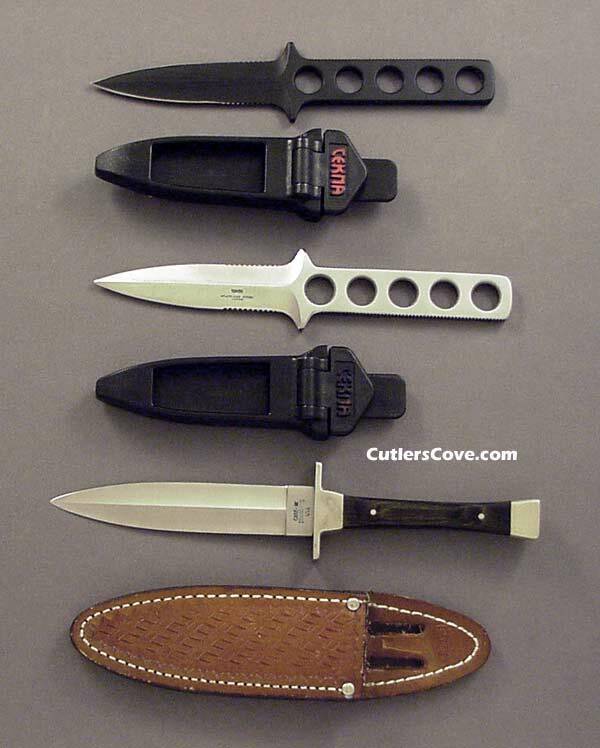 Dive Knife. Boot Knife. Tekna dagger that is all black with original sheath. It is one piece of metal with holes in the handle and two sharp edges. The sheath and knife are in near mint condition. The blade is 3-3/4" and it is 7-1/2" overall. It has not been sharpened and has very light wear. The ABS sheath has a metal clip on the back side and quick thumb release lock to hold the dagger in. Tekna satin dagger with original sheath. It is one piece of metal with holes in the handle and two sharp edges. The knife is in excellent plus condition. The blade is 3-3/4" and it is 7-1/2" overall. It has been sharpened and has wear. The ABS sheath does not have a metal clip on the back side but does have a quick thumb release lock to hold the dagger in. Tekna Dive Knife was a favorite among divers because of its versatile design and solid, one-piece construction.